Martin Kippenberger skipped out on this world after just 44 years – in 1997, the art world’s flamboyant enfant terrible, one of Germany’s most famous painters and best known for his biting provocations and prolific output, died of the consequences of his equally prolific alcohol consumption. In 1978, Kippenberger moved to Berlin, launched „Kippenbergers Büro“ (together with his future gallerist Gisela Capitain) and became the managing director of Kreuzberg’s seminal venue SO36 where he proceeded to confuse the local punks with acts like Red Krayola, Scritti Politti, Kleenex or Kevin Coyne. His own band Luxus (featuring Christine Hahn of Malaria, among others) released a limited edition single in 1979, available in homeopathic quantities. In subsequent years, he cranked out a steady stream of further singles, a. o. with fellow painter Albert Oehlen. Kippenberger’s not so secret love and passion, however, was swing music – expansive, and possibly pompous, big band jazz – and traces of this have found their way onto a Golden Kot Quartett release, which lists Kippenberger as its drummer. Yuppi Du, on the other hand, makes the most of his Dadaist humour, while several versions of Ja, Ja, Ja, Nee, Nee, Nee pay tongue-in-cheek homage to Joseph Beuys. 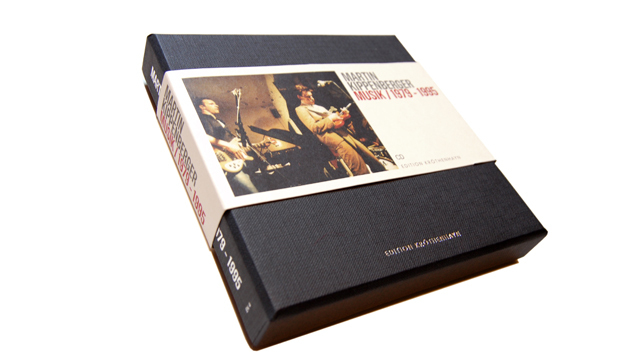 Now, give or take three decades later, Edition Kröthenhayn releases the surviving works of Kippenberger and his friends on CD and vinyl. Expect 60 minutes of music: jazz, noise and obscure sound experiments squeezed into a limited, hand-numbered (1000 copies) 10” vinyl box containing three records and a book or an equally limited CD box featuring a 72-page book. Both editions come replete with a slip lid box and banderole and are prime examples of luxurious, high-quality bookbinding. In addition, essays and writing by Max Dax (Spex), Wolfgang Müller (Die Tödliche Doris) and Frieder Butzmann are accompanied by many previously unpublished – and unseen – photographs.